Welcome to this spring book study. This Friday we are going to discuss the Introduction and Chapter One. Now, let’s be clear that this book is a prayerful journal that is designed to help you find joy in simplicity. It’s not a housekeeping book in the traditional sense of the word. There are no tip on how to dust or where to store your shoes but rather a sharing of some simple systems that make the challenge of simplifying a little easier. What I found fascinating in this chapter was how Abby shared a description of the Holy Family’s home as described in the book The Life of Mary. The humble spaces in which the King of Kings lived and grew up should call us all to living simply and the practice of detachment. The Blessed Mother lived in a very humble abode and cared for it as if it were the greatest of palaces. This should call us all to ponder her great humility and holy indifference to the material world. Abby provides quotes from Holy Scripture and from a few saints (one of my favorites St. Frances De Sales) to get us thinking, first, about the virtue of simplicity, and then detachment. The twelve passages referring to simplicity call us to dig deep in our hearts and reflect on what simplicity means in a spiritual sense. DO we seek to be like God who is, as St. Vincent De Paul says, “most simple in his essence”, or so we take on the world’s meaning of simplicity, which if you consult Pinterest, has a very different meaning. 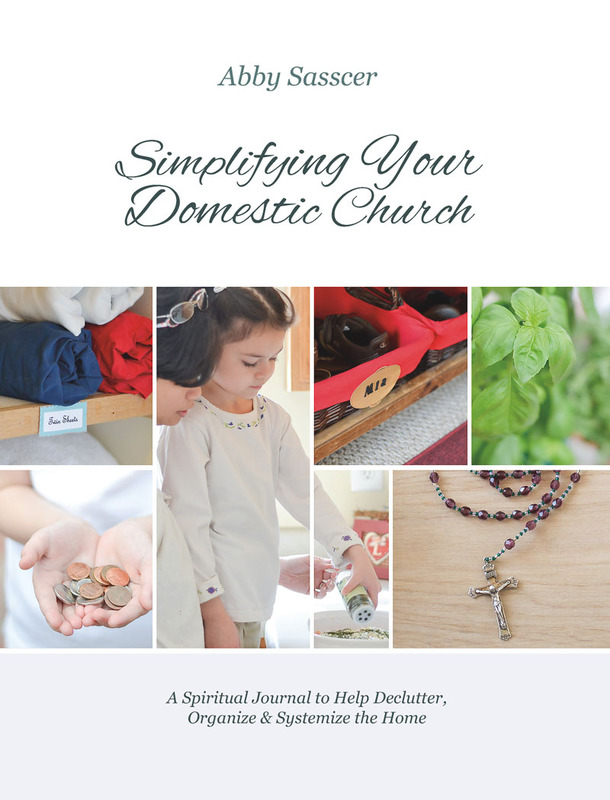 A worldly definition might include decluttering and buying a lot of cute labels and containers but is that what we are called to as Catholic homemakers? This leads right into the discussion of detachment. We can not be virtuous in our simplicity without practicing detachment. To practice detachment I think it is useful to consider the difference between a need and a desire. Do we really need another sweater, pair of shoes, kitchen gadget or whatever it is or do we just desire to possess this item for the way it will make us feel in the short term? Will this object bring me further along the road to holiness or will I be cursing at it in a year or so because I have no where to put it? Material possessions are not wrong and we all need a certain amount of them but I think Abby’s words call us to discern our attachment to things and why we are attached. So this week let’s read through the scripture passages of the Intro and Chapter One, making notes where we feel called to ponder, my favorite is on page 20 St. John Chrysostom, and think about how we can deepen our detachment to the objects in our home. I would also encourage you to walk about the house and look at your things and try to see what things have use and meaning to you. What could you live without? What do you really love and what do you not care about at all? Honestly if everything in our storage room burst into flames would I even know it was gone? Do I need any of that stuff? This is the question that I asked my self this week and I was a little surprised at how little is in there that I really care about. I also asked myself if God needs me to have this The answer is inevitably no. So for next week, let’s make some notes and see how far our scripture readings can go towards leading us to detachment. Also let’s take a look around the house, casually, even going so far as to touch and handle things, with an eye toward possibly giving it away. Will object this impede or propel your progress toward a more simple life? Some extra reading, should you be so inclined, Introduction to the Devout Life by Saint Francis De Sales and Interior Castle by Saint Teresa of Avila two spiritual powerhouses that lived the Gospels in as close a way as possible. I highly recommend them both for anyone seeking to grow closer to God. Do I pray about it when I am about to acquire more possessions? Should I be doing that for every little thing (think Home Goods)? Does the idea of living more simply (with less stuff) bring a sense of peace or anxiety to me? If it’s anxiety why is that? (For myself I’m often anxious about hurting people’s feelings if I give away something they gave me, or the feeling that I will need it again “someday”). Next Friday we will work at Chapter Two. Thanks so much for joining the discussion. Thanks so much for leading this discussion, Mary Ellen! I will take these thoughts to heart and share more soon. It’s a blessing to have a group to get and keep some momentum going. It’s not an ideal time for me to make time for this, but when is it ever?? I do want to live in hope that I can grow in this area of my life, for my present and eternal good and the good of my family. Thanks again! May God bless and encourage us all, with Mother Mary and the saints’ help and witness (and Abby’s help, of course). . . .
Amy: every season of life brings it’s own challenges and if this isn’t the time for this type of household focus now, it’s just not. I have a list going of things to accomplish at different stages of mothering and it’s ever evolving. We really have to bring these things to prayer. I’m so glad you are peeping in here though.